Hey, my awesome friends! Today I have for you a super simple brunch idea that can easily be considered a dessert too. 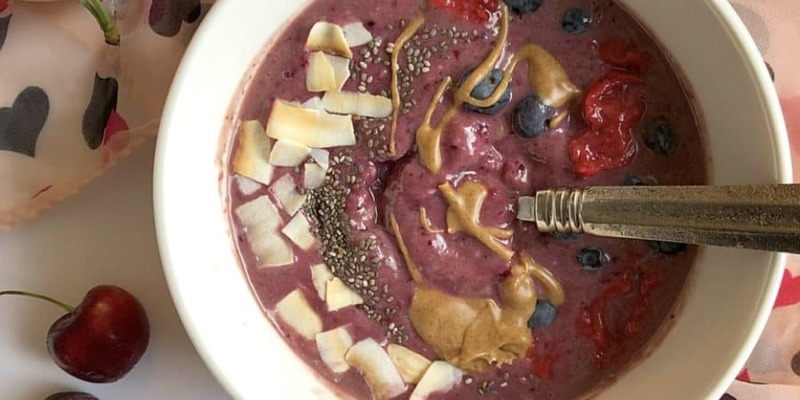 It’s super nutritious, easy to make and above all absolutely delicious! I will remind you of an acai bowl, so if you love those then this will also be a favorite of yours. I try to utilize ingredients that are in season and right now you can’t miss those beautiful cherries in the market. They are sweet but tart and the color is just wow! I had to buy them and use them in a recipe. 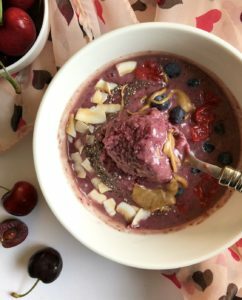 Here it is, a cherry banana smoothie bowl perfect for any time of the day to cool off. Top it with your favorite toppings and you got yourself one heck of a meal! Did I mention its dairy free, gluten free, and vegan as well? You can’t go wrong! Blend all the main ingredients together for about 1 minute. Then add the toppings of your choice! It’s that simple folks!